In the current age of advanced technology, it’s become easier than ever for brands to spread a message to its target audience with a simple click of a button. People receive news, updates, and advertisements through emails, on their social platforms, and virtually everywhere else possible online. Because of this shift in communication, that leaves a large number of people wondering—does a press release still hold the same value it once did? I have attended multiple educational sessions where the question, “Is the press release dead,” has been posed. Invariably, the journalist in me cringes at that thought because I can personally attest to the positive impact press releases still have. And I’m not the only one: according to Cision’s State of the Media, 63 percent of journalists continue to rely on public relations professionals for sound story leads. Furthermore, those conversations were spurred from press releases more often than not. While I agree that press release distribution strategy has evolved, there are three big reasons to believe the press release is still alive and well. Press releases provide updates to stakeholders. As we’ve mentioned before, when a press release is executed properly, it can reap huge results for your brand. Specifically, press releases that include timely news are a great tool for providing strategic context to your brand’s target audience. We recommend sending press releases to announce new hires, promote product launches, and showcase company milestones. Press releases increase brand credibility. A press release is essentially a piece of news about which your company controls the messaging entirely. While many journalists will use the release as more of a guideline when crafting their own story—rather than publishing verbatim—they cannot stray from the information you provided. Additionally, a press release is a vehicle to share data and insight, thereby elevating your company as a valuable resource when it comes time to speak on industry trends. Press releases generate sales leads. Every good press release ends with a call to action (CTA) that leaves the reader with a sense of urgency centered around the main message. When following the inverted pyramid methodology, you should tee up the call-to-action with supporting information that explains why the reader should feel compelled to reach out to your company. When executed properly, the press release has created a conversation with a potential new customer that could result in an increase in sales, or at least a relationship that you can nurture going forward. While sending a press release is great for getting your story heard, we also recognize it’s a small tactic that makes up a brand’s public relations strategy, which ultimately should support the overall marketing strategy. We’d love to support you and your brand with a strategic public relations strategy—reach out to us at info@dma-solutions.com for more information! We extend a Texas-sized congrats to the marketing teams from Avocados from Mexico team (Best of Show Winner) and Famous Software (Second Place Best in Show). Both companies put their best foot forward on their in booth presence with bright backdrops, engaging graphics and friendly faces welcoming you in the booth to learn more. If honorable mention were an award, we would consider presenting it to HMC Farms who featured two stunning backlit towers that made their graphics and products pop. 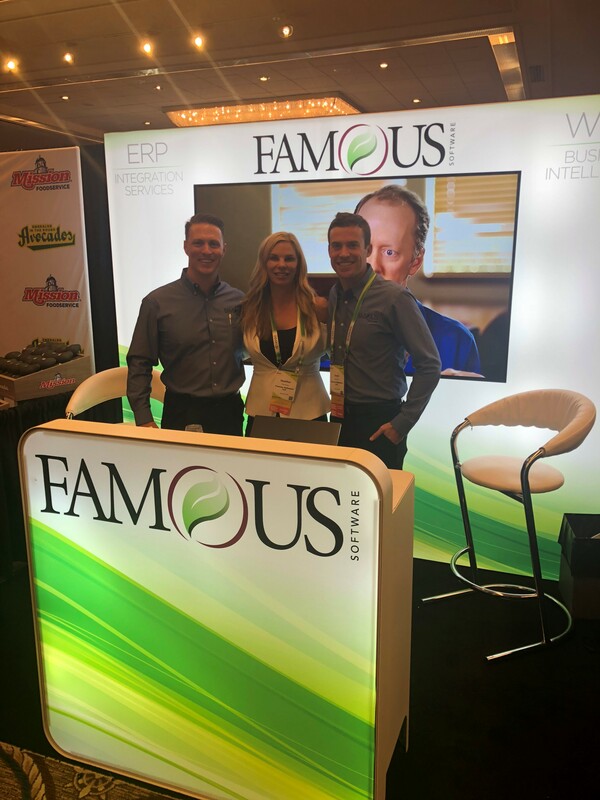 Both the Famous Software and HMC Farms booths serve as a great reminder that something as simple as lighting can greatly enhance your presence on the tradeshow floor. Don’t overlook them as you prepare for PMA Fresh Summit! 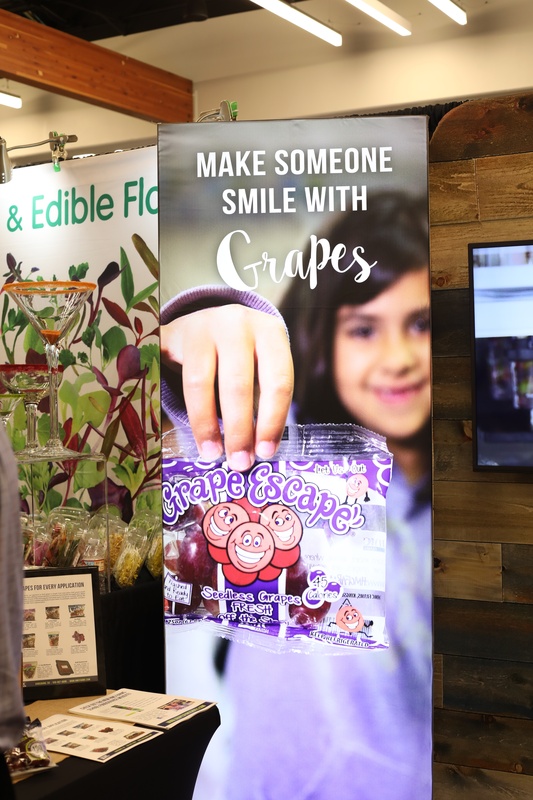 Our experience at PMA Foodservice 2018 was one we won’t soon forget and we are grateful for the opportunity to take part in the many facets of the show from planning to execution in Monterey. We commend PMA for taking exhibitor and attendee feedback from previous years and putting it to work to create better experiences for us all. Until next year, we will be looking for evidence that Danny Meyer’s voice was heard during the event with new, enriched innovations and concepts emerging from the industry. In terms of what we think could be improved for the show next year? We would like to see more purposeful placement of signage and communication around the expo on the 2nd floor of the convention center to guide attendees accordingly. Overall, we enjoyed fruitful conversations, lots of hugs, laughter and reminders as to why we love investing in and attending shows with a specific focus and working in our industry so much! Thank you PMA for a job well done and see you in Monterey in 2019.